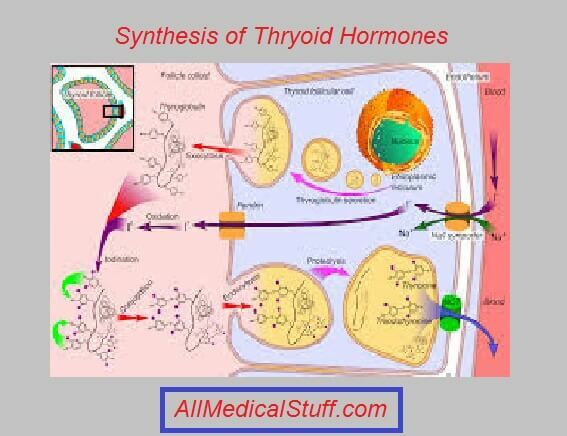 Thyroxine (also called T4) is a hormone secreted by Thyroid gland. It is secreted more then other thyroid hormones and control metabolism of Human Body. 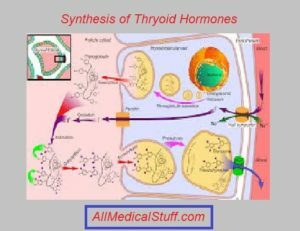 As mentioned above, thyroxine which is also called tetraiodothyronine (short form T4) is secreted by follicular cells of thyroid in largest amount. As compared to his partner T3 (triiodothyronine) it is secreted 80% by throid gland while T3 is secreted only 20 percent. But thyroxine is less potent than its partner. Recommended: Learn about All the differences between thyroxine and triiodothyronine. In the first step iodide is transported to inside of thyroid gland. This is an active process. The reason is that, iodide is present in more amount inside than outside. And it needs energy to be transported. This is done by sodium iodide symporter. You can read here more about sodium iodide symporter. The second step involves the conversion of iodide to organic iodide. This happens by the action of peroxidase enzyme. The third step is called iodination of thyrosine. Thyrosine is an amino acid and is iodinated by the same enzyme thryoperoxidase. When single iodide is added to thyrosine it is called Mono iodothyrosine MIT. When two iodide are added to thyrosine it is called di iodothyrosine DIT. In the fourth step one MIT and DIT combine to form Triiodothyronine or T3. Or two DIT combine to form throxine also called T4 or triiodothyronine. In the last step T3 and T4 are broken down from thyroglobulin and released in blood stream. Basal metabolic rate called BMR is increased by the influence of tryoxine. Thyroxine increases all the metabolism of the body and thus increases energy productions and utilization thus increase BMR. It has effects on almost all the systems of the body i.e GI system, cardiovascular system, central nervous system. It influence bones, growth and development and reproductive system. Decrease in tyroxine production i.e in hypothyroidism total metabolic rate and vise versa. Thyroxine is directly related with energy production. It does so by activating and deactivating enzymes that are involved in carbohydrates, fats and proteins metabolism.